Vintage From Paul is delighted to offer these classic Wellsville Restaurant China Crest Green Plates. The Wellsville Restaurant China Crest Green Plates date to the 1930's to 1940's. This pattern has a white background with stencil airbrushed gun metal gray wavy rim design. Similar patterns were produced by other manufacturers with stencil airbrushed waves, crests, scrolls or rick rack designs around the rim. 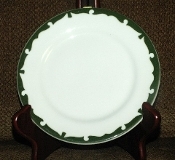 The patterns from other manufacturers include Everglade from Shenango, Lancer by Jackson China, Tidal by McNicol, Wintergreen by Syracuse China and Normandy by Mayer China..
Each of the available Wellsville Restaurant China Crest Green Plates is in mint condition with no chips, cracks and appear to be unused. The Wellsville Restaurant China Crest Green Plates measure 6-7/8 inches in diameter. The back of the Wellsville Restaurant China Crest Green Plates is marked with; " Wellsville China U.S.A."